To be called ventricular tachycardia (V-tach or VT), there must be a minimum of at least 3 wide (> 120msec) complexes in a row. Non-sustained V-tach consists of a run of wide complexes that abruptly start and stop but do not last longer than a few seconds. Sustained V-tach is usually due to a re-entry mechanism within the ventricles and is often precipitated by a PVC occurring on the partially refractory myocardium that is at the end of the preceding depolarization’s T wave. 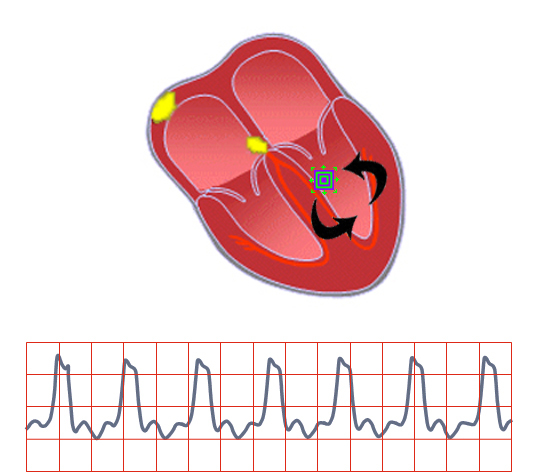 Monomorphic VT usually demonstrates a recurrent morphology with a rate of 150-200 bpm and has a single focus of origin. Polymorphic VT will have multiple QRS profiles and carries a much graver prognosis.